You hold within you the power to create vibrant states of health and well-being that you intend for your life. In this program you will learn to meditate and relax on ever deepening levels, where the attention you focus on healing and renewal will directly impact your body and your life. These are blissful states of reverie that are proven to enhance immune function and activate the body’s natural healing abilities. In this quantum state of renewal, your body triggers its own powerful bio-chemicals to heal illness and cure disease. Fact 1: Your body can manufacture and administer the precise balance of neurochemicals that can reverse illness and cure disease. Your body posseses the inate capacity to heal itself. Fact 3: You can consciously influence and direct the body's output of health chemical information through meditation and visualization techniques. 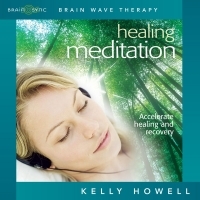 This powerful meditation is highly recommended by doctors and offered to patients at America’s most prestigious cancer treatment hospitals.